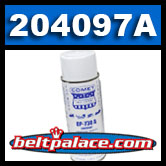 Comet Industries 204097A, GP-730A Spray Lubricant - Single Can. Comet Industries World Renowned Dry film lube that works wonders for clutch systems. Hundreds of uses! Bonds to the surface within 2 minutes for long life. Will not dust away or dislodge. Inert to water, oil, solvents, alkalies, and many acids. Works wonders on ferrous and non-ferrous metals, wood, plastics, rubber, fibrous, and many other friction surfaces. Contains no oil, grease, or silicone. SPECIALLY PRICED WHILE SUPPLIES LAST! * RESTRICTIONS APPLY TO SHIPPING OF CHEMICAL PRODUCTS. Comet 302294A Pivot Pin Kit for 780/500 Series Drive Clutch. Comet 302294A Pivot Pin Kit for 780/500 Series Drive Clutch. Comet Industries 302294-A.